There’s a saying, "Out of sight out of mind". But what happens when you come across an object which is completely in your face but so out of place? Well I take photos… and wonder. I just love this lawn mower. So sad and so unable to do it’s proper job. I’m starting to wonder if some of these things fall from the sky? In my last post I mentioned this kitchen door recycled to fit a gap in a dry stone dyke. I finally found the original photo. One thing that I can never get over is how builders leave on the barcode stickers on timber (or hinges in this case) when they’re building a structure. I just feel that it’s untidy. It takes me back to the days when I first learnt proper dressmaking skills. Miss Simpson was my sewing teacher at Dollar Academy, the secondary school that I went to in Scotland. I have a lot to thank her for and one of these things was her exacting standards. I learnt how to finish off seams properly, how to sew a hand sewn buttonhole properly and how to sew on a coat button with a shank…properly. Thank you Miss Simpson you wouldn’t believe how I’ve used these skills and standards in my art career! Back to what’s considered proper and tidy. 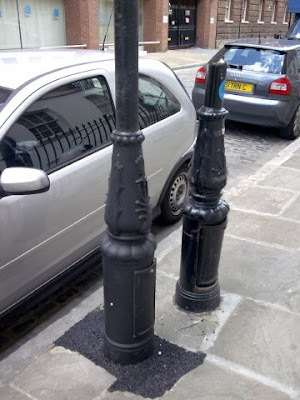 Shouldn’t you remove the old lamp-post when you put up a new one? Shouldn’t you put your mug away after using it? This so reminds me of my Mum. When I was little it was quite normal to find a trail of empty mugs left around the garden. She’d take her coffee out to drink in the garden. Very often in the morning she’d wander round (still in her nightie) having a bit of peace and quiet (meditation?). She always seemed to leave loads of cups behind as she got side tracked into a bit of weeding or whatever. She’s either cut down on her coffee or I just don’t have those super observant eyes of a child to notice her Hansel and Gretel trail of cups now. So, to end on a gardening note, one of my absolute favourite photos on the theme A Place for Everything. When is a Box Hedge not a Box Hedge? … When it’s a Window Box Hedge!!! !